One of the coolest little towns we have been to in Asia is Nuwara Eliya in Sri Lanka. What makes it unique is that it doesn’t look Asian at all. You feel as if you have stepped back in time to the 1940’s in England. The town is made up of Old Victorian Architecture bordering the race track and golf course. You can feel the influence of the British all around especially walking along the Grand Hotel Road. 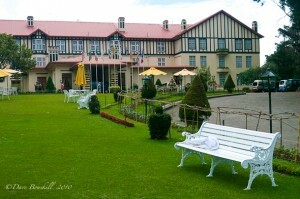 Large estates set back on hills and well tended lawns have been converted to hotels. We even saw a couple of clay tennis courts. The European flare is undeniable. Timber houses are now restaurants, and even the post office, public toilet, information centre and police headquarters look like they are from jolly old England rather than in Buddhist Country in the Far East.